Moar Vermont Double IPAs! VT DIPAs forever! This one hails from Frost Beer Works, a bit southeast of Burlington. Not technically VT beer roulette since I'd actually heard of these guys before and Eric recommended I grab a bottle as it had just been released and was thus fresh. Oh, and it's apparently pretty good. It's part of Frost's "Research Series", basically their experimental arm of one-offs (or are they? This seems to have been made before, so perhaps they're still "researching" this, though from what I can see, it's clearly ready for the big time). Supposedly this is a double-dry hopped version of their standard DIPA, called Lush, though their website lists a different Research Series beer that was also that, so who knows? 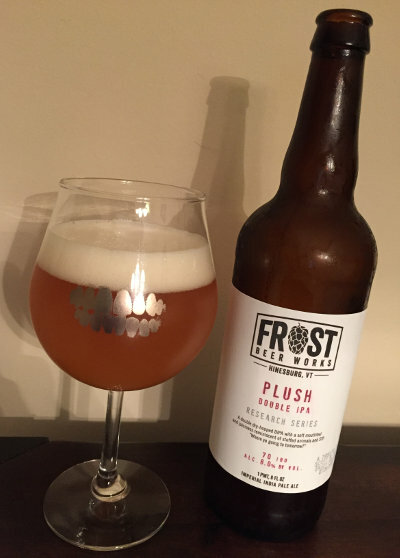 Frost Beer Works Plush - Pours a hazy dark gold color with a finger or two of fluffy white head that leaves plenty of lacing as I drink. Smells quite nice, sweet, candied citrus, mangoes. Taste also hits those sweet notes up front, lots of citrus of the mango kind, not much bitterness here but enough to feel balanced. Mouthfeel is finely carbonated, medium bodied, surprisingly quaffable for an 8% DIPA - I downed quite a bit of this without noticing how much. Overall, whoa, another VT DIPA that's really good, shocker. B+ or A-, I don't know anymore, my palate is drowning in hops. In, uh, a good way I guess. This page contains a single entry by Mark published on August 16, 2016 8:04 PM. Burlington Beer Co. Double Feature was the previous entry in this blog. Alchemist The Crusher is the next entry in this blog.